I am always bad with direction. This is something I can't denied. In any other times, my sense of navigation with my eyes and nose would not let me down. Somehow I didn't factored in that certain parts of downtown LA does not have a through street. I blamed that on the lousy google map app on my iPhone. I was in a rush one night to get to this mini style cafe on one of the "newest" and "happening" plaza in southern California. There seemed to be a grass root campaign in opening up a trendy hub center for dining and shopping center that can generate buzz for the youngsters here. Yup folks, the mall is the blase of the 80s and we're living in the new Millennium. In what was a overlooked decision on my research, I also didn't know that the hub center also holds a hip market/food stalls gathering where those Millennial would congregate every Sunday. That plaza is fabulous called ROW DTLA, a terminal market back in the old days with wholesale factory warehouses in walking distance close to each other. 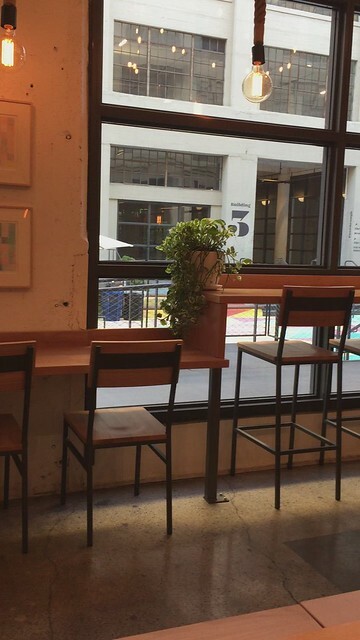 The Manufactory building is now a converted restaurant row while other parts of the factory warehouses become boutique stores, gentrified coffee houses and remodeled restaurants. The wholesale farm market is now a weekly Sunday Foodies meet-up as new colorful, unique food are served on these food stalls. So, what does it have to do with me getting lost? Well....google Map couldn't keep up the new happenings as the fences and walls are build up, while the neighboring warehouses bordered up the road with their mangy iron clad gates that used to connect to my destination. When I got there, I was assuming the place I wanted to visit would be closed up because I arrived a good 5 minutes after the reported closing time. To my astonishment, they pretty much welcomed me in on that frenzy Sunday. You can guessed I was in a much better mood to check out on parts of this cafe with picnic benches. 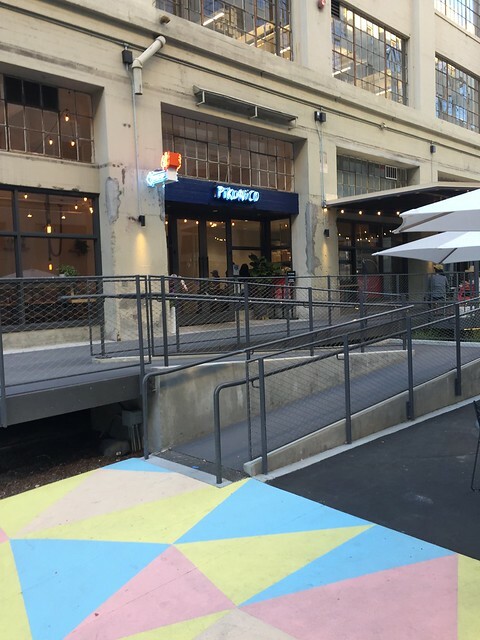 Pikunico have a modern look of a chic style cafe that serves Japanese Fried Chicken. They have a long communal table that is affectionately known as "The Bench". What I craved the most was their talked about "Golden Chicken Sandwich". When I was in a disparaged mode of trying to get into ROW DTLA, all my thoughts was on that sandwich. It was the only thing that was keeping me from falling apart in getting around the dead end streets. The lady that took my order was a cheery fella that was patient and more than happy to serve. She could have played it off as though they were closed. I probably would have been bummed, but I would have understand. To make one of their last order easier, I got the order of Chicken Sandwich and a mix tray of chicken as a takeout to go. Let me just say that after tasting all of the chicken, I was ecstatic. One, I was pleasantly surprised by the evenly distributed of the breading in the fried chicken. 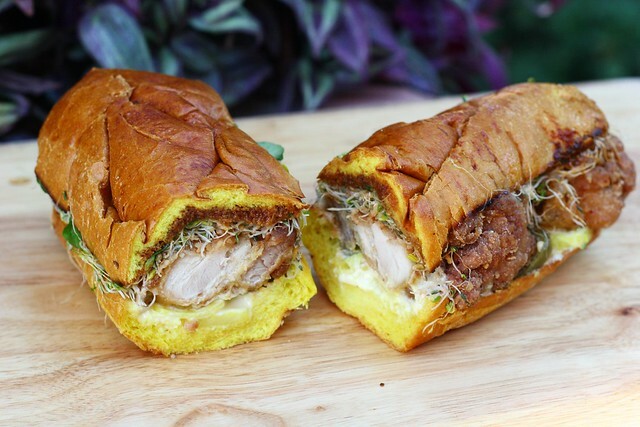 My sandwich itself has one of the most unique turmeric bun that is filled with watercress, jalapeno, and a lemon flavored aioli. The part that conquered me over was their miso jam that was smoldered over the chicken. This sandwich not only won me over, but more importantly it made me go back to try something else. Part of the weird journey was that I was in a happy mood to go back and try their other side items. I decided to get their Chicken Egg Drop Soup. To my memory, they didn't included the diced up chicken bits in the Egg Drop Soup. I think that was a good decision to added on because it makes this bowl of soup more heartier. The big ominous surprise that I will say was the onigiri rice. 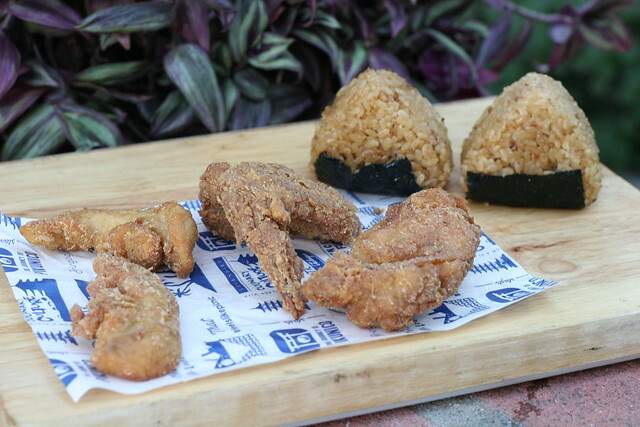 It's their housemade rice ball that seasoned with ginger and garlic that is wrapped with nori seaweed. That to many looks unspectacular, but in this was the best thing to arrive to my mouth in a while. It doesn't contained spam or meat, yet I was extremely in peace after chomping on those two onigiri rice balls. The lady that took my order on my ill-fated trip to ROW DTLA? That was the creative chef Kuniko Yagi. Once I found out she was the executive chef at SONA, I knew there was a reason why I wanted to make that trip to this Fried Chicken cafe in the first place. Truth to be told, I think I was searching up Japanese Fried Chicken and internet kept pointing me to that chain in Sawtelle Blvd in West LA. I was glad to be pointed here instead. If that fateful trip didn't turned out well, I probably would missed out on the terrific Golden Chicken Sandwich. Worse... I wouldn't have discovered their onigiri rice. My pro tip, ordered their chicken tray and skipped the fries by getting the onigiri rice. That would be winner winner chicken dinner any time. Pff...I can't believed that phrase was typed.